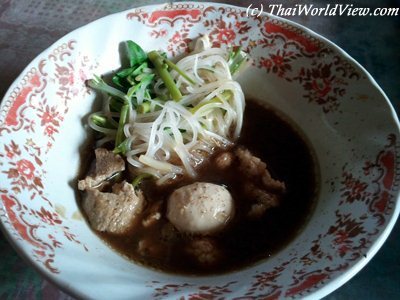 Everybody knows the famous food of Thailand, which is a mix of spicy and sour tastes. Thailand is divided into four main regions, i.e. North, Northeast, Central, South. Each region has its own culinary specialities. Rice is the basic aliment in Thailand. Rice is eaten with most dishes. The word "to eat" in Thai language is "KIN KHAO" (กินข้าว), which means "to eat rice". There are different types of rice. The steamed rice is called "KHAO SUEY" (ข้าวสวย). One of the most famous is sticky rice ("KHAO NIO" - ข้าวเหนียว) from "ISAN" area (อีสาน - northeastern part of Thailand). Thai people eat it with hands by making small balls. Central plains people often say that "Eating sticky rice make you lazy" so that's why before "ISAN" people have the wrong reputation of being lazy. Nowadays central plains people also like eating sticky rice. 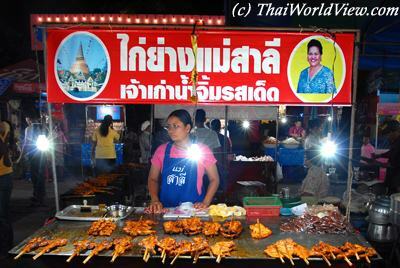 With migration of many workers to Bangkok, recipes from different regions of Thailand has come to the capital. Some famous Isan dishes include the spicy salad ("SOMTAM" - ส้มตำ - on top right), the grilled chicken ("KAI YANG" - ไก่ย่าง - in the middle), the sticky rice ("KHAO NIAW" - ข้าวเหนียว - on top left), the beef salad ("NEUA NAM TOK" - เนื้อน้ำตก - on bottom). During a Thai meal, all the food is served together. No entrée, main dish and dessert like in westerner countries. Meals are eaten together and shared. In most cases, Thai people don't eat dessert. Dessert (fruits, cakes) are eaten when going out for a walk. All food in the plate shall be eaten. Thai people don't like to waste food, especially rice. 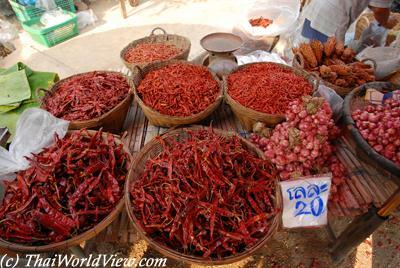 Thai food is famous for its small pimento ("PHRIK KHI NOO" - พริกขี้หนู). Some are red, green and most of times pimento are cut in slices. Most people think they can get rid of the "spicy" taste by drinking water. That is wrong. A good way is to eat rice. Thai people like to speak about food, about next meal. The sentence กินข้าวแล้วหรือยัง ("Have you already eaten ?") is same as "How are you ?" in everyday speech and is often used to start a conversation. Thai soups (ก๋วยเตี๋ยว) shall be eaten with a spoon and chopsticks! Chopsticks are used to catch the fish or meat balls floating in the soup.